Ideally located on the slopes, the chalets enjoy ski-to-door access. 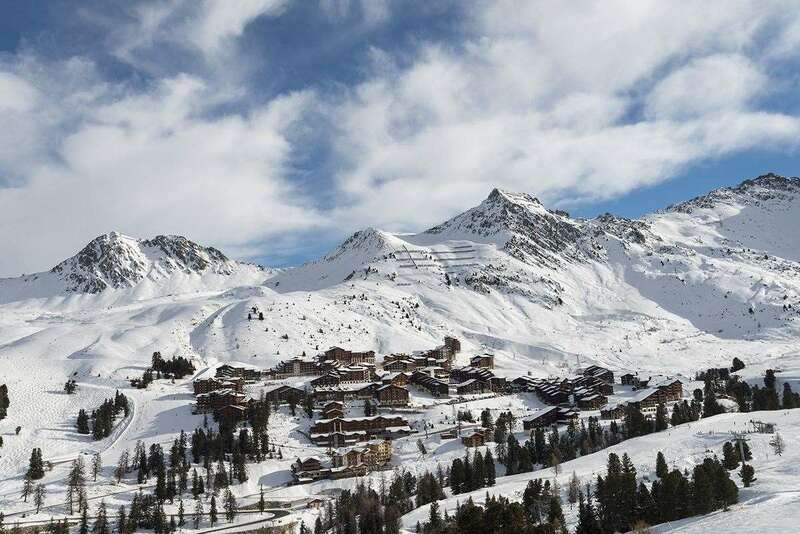 The central square of Plagne Soleil, with its small selection of shops, bars and restaurants is on your doorstep, whereas the main resort of Plagne Centre is easily reached by free shuttle bus or car. The Chalets des Alpages are south and west facing, and are built in a traditional wooden style. All chalets come with a fireplace, and extra firewood is available to purchase from reception. After a hard day’s skiing across the breath-taking and extensive Paradiski, ski or stroll straight to your accommodation, leaving your equipment in the storage area. Relax in the privacy of your own chalet with a cosy fire and the freedom to cook and eat as and when you like. Les Chalets des Alpages welcomes families and smaller children, with cots and high chairs available on request. Bilingual staff are on hand to assist with any queries before, during and after your holiday. With both the call centre and resort team able to help with ski hire and lesson booking, alpine excursions, linen rental and things to do in the resort. The Chalets des Alpages are perfectly equipped to make your stay as enjoyable and comfortable as possible. The kitchens are modern and furnished with hobs, microwave and/or oven, a fridge-freezer, dishwasher, toaster, kettle and cafetière. Most of the chalets have a terrace and all have sunny balconies. Bedroom one contains two single beds, bedroom two has one double or two single beds, and bedroom three has three single beds. There’s also a bathroom and a shower room with two toilets. Bedroom 1 contains two single beds, and Bedrooms 2, 3 and 4 each have one double or two single beds. Bedroom 1 contains three single beds or a double and one single bed, Bedrooms 2, 3 and 4 have one double or two single beds each. Bedroom 1 has a double bed, Bedrooms 2, 3 and 4 have two single beds each, plus there is a cabin bedroom with cabin beds. There’s also a bathroom and two shower rooms with three toilets. All chalets are self-catered, and come with a fully-equipped kitchen, giving total freedom to cook and eat as and when you wish. Ask at reception to hire a raclette or fondue kit for a traditional and tasty evening in. There is a small supermarket within walking distance, and the small resort of La Plagne Soleil features a good selection of restaurants and bars. Guests can catch the bus into the main resort of La Plagne Centre for a wide variety of places to eat and relax.